A diver who helped find 12 boys trapped in a Thailand cave has been honoured by his home city. Rick Stanton, 57, from Coventry, was one of the first rescuers to reach the boys and their football coach who were stranded in the flooded Tham Luang cave earlier this year. 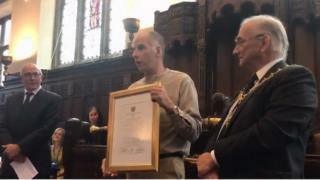 The ex-firefighter was awarded the Award of Merit and a Good Citizen Award by Coventry City Council. At a council meeting the cave diver thanked residents for their support. He said: "I really believe people in Coventry followed me and were supportive of me [when I was in Thailand] and for that I'm really grateful because it actually meant a lot to me." There had been no contact with the group for nine days when Mr Stanton and his diving partner John Volanthen located them in early July. The entire party was led to safety later the same month. Councillor Abdul Khan, the cabinet member for policing and equalities, said that the local authority had been keen to recognise Mr Stanton's "act of heroism".